Back when Allo was supposed to be the next big thing in messaging, Google was loading its new app with exclusive features to make it more desireable. 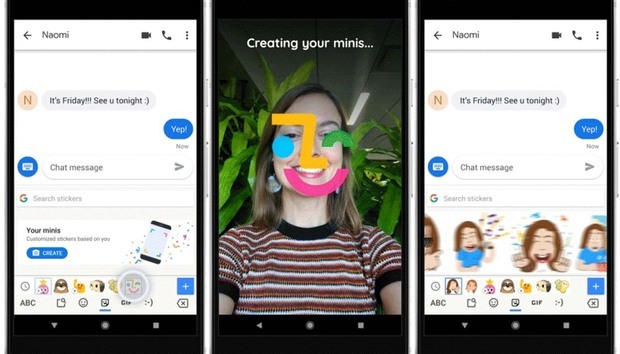 Sadly, most of them didn't do much to woo people to the platform, but there was one feature that nearly convinced us to make it our default messaging app: AI-powered custom selfie stickers. Download the free Gboard app on iOS or Android and set it as your primary keyboard. Tap the emoji button to the left of the space bar. Select the Stickers icon (the square with a face). Tap on the Mini icon at the far left. Wait for Google's AI to work its magic. Tap customize to fine-tune your "Bold" or "Sweet" Mini. Find your new Minis inside the Stickers tab. Select your favorite auto-generated stickers and send them to everyone you know. Gboard's new Minis can be used in any app that supports stickers, but you'll mainly be using them in messages. You'll get two different sticker sets—Bold and Sweet—and each has hundreds to choose from, with more on the way, according to Google. Apple has a similar feature called Memoji coming out in iOS 12 that lets users create animated 3D images of their faces. However, only users with iPhone X devices and later will be able to create them. Why this matters: Stickers are fun and all, but the more meaningful takeaway here is that Allo is all but dead. That shouldn't come as a surprise to anyone, but if you're still using it, I'd guess the app could completely disappear completely within the next 12 months. Or 12 years. After all, it is Google. « Chromebooks versus Windows laptops: Which should you buy?